Summer bags, the irresistible seasonal accessory. Enough said. These are lightweight simple and (except for one) sanely priced. J. Crew Garrison satchel, linen and leather, $99.99 on sale. Blue ikat tote by Etsy seller joesbrand; made by hand. Uzbeki fabric, brown leather bottom, handles and trim, $165. 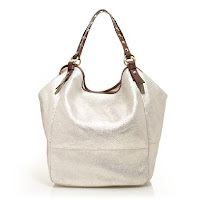 Metallic Beacon tote, $228 on sale, J. 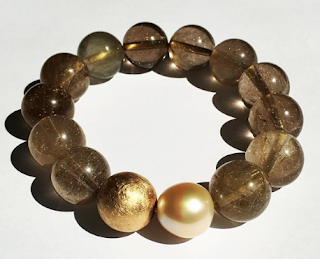 Crew; shown, pale gold, also in pale silver. 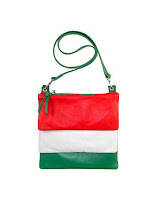 Fontanelli Italian flag triple-envelope leather shoulder bag, just in time for the World Cup, $195 from Forzieri. 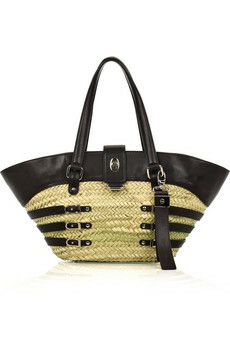 High end: Bazli raffia and leather tote, Jimmy Choo, $995. A terrifically chic bag, you do get what you pay for, sigh. 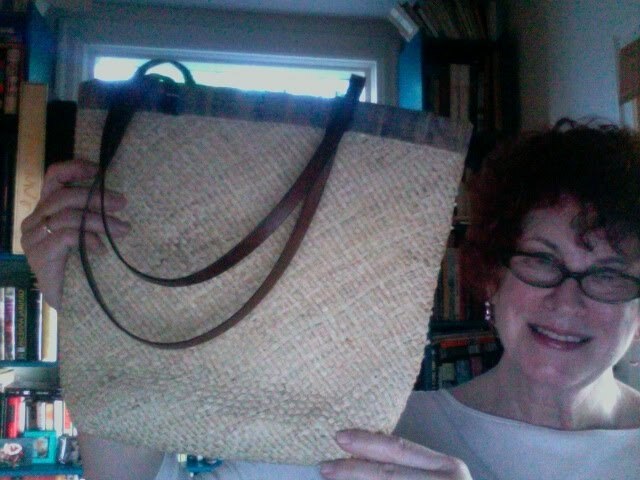 Low end: Mint condition Italian raffia and leather-trimmed (in an interesting cork-texture) tote, $5 at Value Village, found by Duchesse! Stopped in to kill 15 minutes before a lunch date, and there it was. Could Frugal Scholar's karma have been telepathically transmitted? 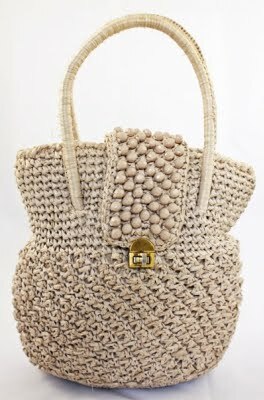 Beige vintage raffia bag, ca. 1970s, excellent condition, £45 from vintage seller Birdie Num Num. 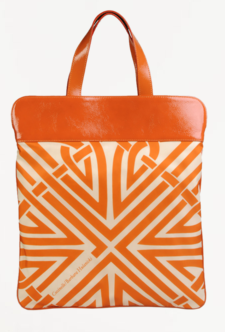 Barbara Hulanicki (the original Biba) varnished fabric bag for Coccinnelle, $325 from Coccinelle. Available in other colours. Anthropologie bag made of recycled sails, $130; from Antropologie; price, $125. For a garden party, a clutch bag with a shoulder chain or strap is smart because you can move about while keeping your hands free for holding a glass or plate. This Aldo "Trimino" laser-cut clutch comes in peach, bone, or black. It's a synthetic, but looks good; I saw a fashion editor carrying one with her Prada dress. Bags of the season, for the sweet, short summer. Now I will mix the family's new favourite summer drink, the Arnold Palmer: half iced tea, half fresh lemonade. I suppose a shot of white rum would make a pleasing apéritif. Cheers! Nice choices! I love the look of linen bags, but alas the lighter colors are only good for one season (at least for me). I'm on the lookout for an inexpensive straw tote, something lightweight and casual for weekends. You've found a beauty! Playing catch-up, my chere Duchesse. . . I apologize for being awol. Sometimes life interferes with one's best intentions. But, nothing is more important than the summer bag. It has been at least two months now that I've been searching for that little perfection. I am not a bag crazy type. I want one do everything, go everywhere, work with everything bijou for each season (not counting of course a couple of major investments, "statement" exceptions and evening numbers). Still haven't found it. I see at least three chez toi I would grab in a second, unfortunately one of them is the Jimmy Choo, but would never. Those days are over. Thank you for your always elegant, intelligent take on what we want and/or need. I hope I DID send you karma. I think the key to your success was that you knew quality when you saw it--and that instinct was confirmed by the Made in Italy label. 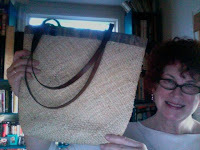 Great find with the Raffia tote, Duchesse! Nice summer choices too. 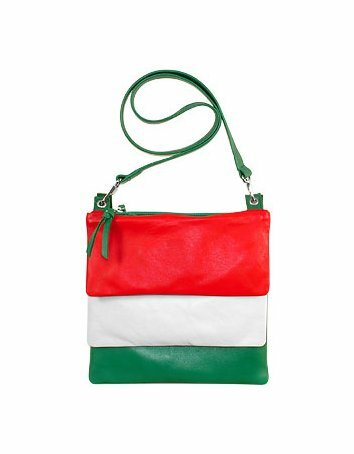 The summer bag is so difficult for me usually and here you've rounded up a few I could easily choose from were I looking. Luckily my current straw tote has survived a a couple of summers and will weather this one as well. It is the same shape as the Jimmy Choo, but not so elegant or dear. 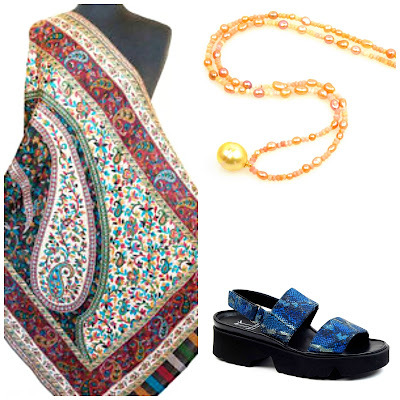 You have managed to round up some tempting choices though and that Anthropologie bag was a surprise for me, their bags are usually a little too precious. J.Crew has made a massive attack on Net-a-porter, so it is available for us Europeans too. But to the topic; raffia and canvas = summer. I do like the shape on the Crew ( the gold metallic typish ), but what is the material? 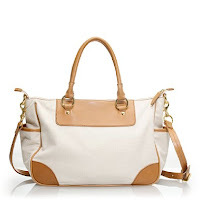 Very affordable bags ( except the J.C. ). Love the Jimmy Choo...but woohoo Duchesse a V.V. 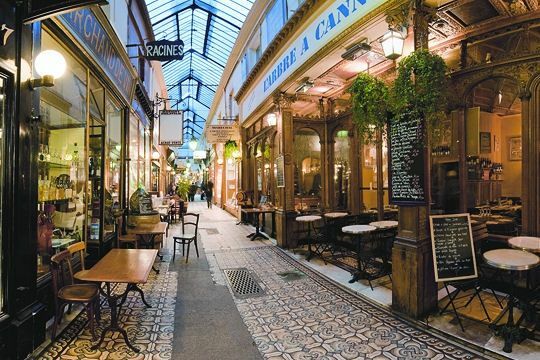 find, you are one savvy shopper! Mmmmmmmmmmmmmmmm: one of each, please! Oh gosh. I confess. I just carry the same bag every day until one morning it says to me, "No more, please." 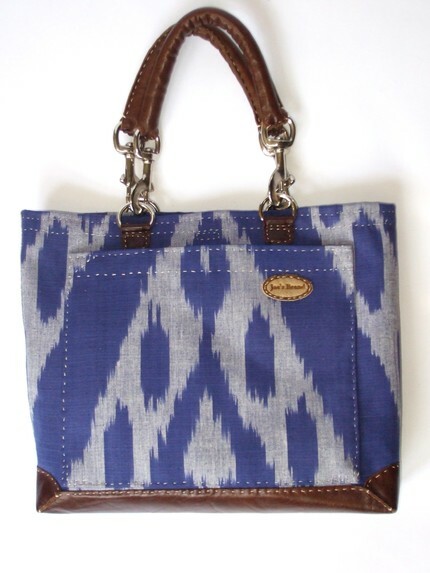 I love the looks of summer bags. But the psychological overhead of transition might just be too much. Pseu: Pale fabrics are vulnerable, but more summery than leather. Tish: You and LPC (Lisa) are at opposite ends of a continuum :) I am not bag cray either but am jarred by a too-heavy bag in summer. Frugal: And now a Chloe dress, please! Mardel: Anthropologie, I would say so, precious and also too small for me. 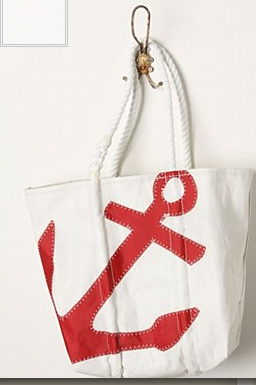 I think that bag is washable; there are other lines that make those sail totes, I like them. hostess: V-squared, as we call it in the family, has yielded occasional treasures and is amazing for glassware. LPC: Honeybunch, you are just so WASP to the bone! I know. I know. Fought it all my life, only to embrace it late in life. I like the look of that metallic beacon tote, I have nothing like it in my wardrobe.